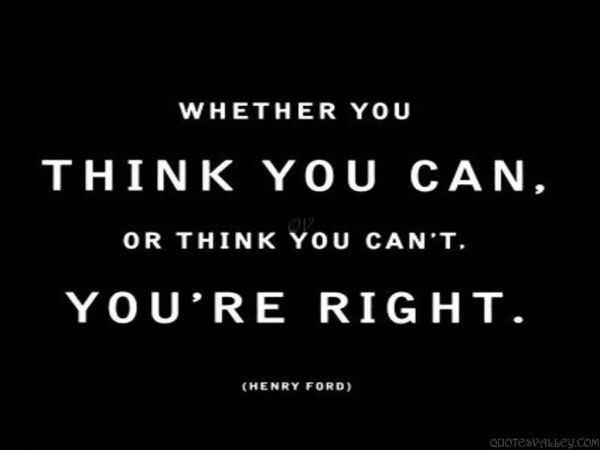 One of the questions I am most often asked by athletes is “Do you really think I can do this?” When I hear this question, I always start to smile. Generally, the athlete asking this question is in generally good health, and has been working out somewhat regularly, or has started working out recently. They come to me, nervous about what lies before them, and want reassurance that they are not crazy for whatever event they have committed themselves to. They seem to think, because I’ve done two full Ironman races, that it all comes naturally to me. But that’s not the case at all. I had to work hard to get to this point in my life, but one important thing I learned along my journey was to never give up on yourself, and to continue to push your limits. We all have our comfort zones. In my past my comfort zone was limited to cigarettes and food. I finally expanded my comfort zone and stepped away from smoking and eating too much, and into exercise. Then it grew to include triathlons, marathons, and open water swimming. But getting there wasn’t easy, and a little bit scary. It’s hard to try something new to you, to learn something new, and that fear of failure creeps in. I remember watching the spin class at the gym, too intimidated to go join them. I’d wait until the class left and I’d cycle alone. I did that for a year before taking a real class. Then I realized I wasted a lot of time worrying about what others would think, when I could have been joining in the fun. I learned that sometimes you have to be brave, to take that first step, to realize that you are capable of more than you can imagine if you only try. So I think back when an athlete asks “can I really do this?” and I smile. Remembering all I went through, people calling me crazy, and still pushing beyond that and realizing my dreams. These negative people tried to make me give up on my goals, just because they wouldn’t try to step out of their own small comfort zones. So they attacked my expanding comfort zone instead. But now I’m in a position to help and encourage others, and I do everything I can to help athletes take that big first step. I remember how hard that first step was for me, how terrifying and scary, and my hope is to make it easier for others to take that leap of faith and believe in themselves. So when they ask me, “Can I really do this?” I smile. I smile at them and confidently look them in the eye and say “The answer is yes….you can do this.” And suddenly, they’re smiling too, because deep down inside them, they know they can. They have started to believe in themselves. I’ve had a lot of time to think over Ironman Mont Tremblant, how it went, and lessons learned from it. Then life got in the way and before you knew it, here we are . . . out of race season and into winter base building mode. So now that I have some free time, here is my race report for Ironman Mont Tremblant. I apologize in advance if this gets lengthy, but here we go. So, to say I was nervous and excited about the race would be an understatement. I was going to race in an Ironman in another country! I have never been to Canada, and I was excited about that. When I told some of my IM friends that I was doing Tremblant, they either said I was crazy, or told me to have fun with those hills. I was worried about the hills, as the race program shows parts of the bike at a 12% grade. The biggest hill, Duplessis, is a three mile climb at miles 50 and 100, and people have been known to walk it because it was too hard. I only hoped I trained enough to make it. The next exciting part of this trip was that I was going to be racing alongside my dear friend, training partner, supporter, and one of the most amazing people I have ever had the pleasure to meet, Kelly Hill. We train together through E11even Athletics, and although this would be the first time we would meet face to face, we have trained and encouraged each other for a long time. This was going to be IM #6 for Kelly, and it felt like waking around with a legend. Having completed 5 IM races, Kelly has a ton of information to share, especially at Tremblant, as she had raced it before. So we made it to Kelly’s cabin which is a couple hours away from Tremblant to spend the night. I finally got to meet Kelly, her husband Steve, and their four girls: Ryleigh, Paige, Megan, and Kenna. They made us feel right at home, and we even got a quick lake swim in before settling in for the night. The next day we made it to Tremblant, and two things I noticed right away: the roads there are amazingly well kept, and that would make biking easier, and that they were rollers everywhere. That would probably make biking more challenging. But it was too late to turn back now. We met up with Tynah Sharpe, Kelly’s friend and the lady that Kelly trains with in Edmonton. This was to be her first IM, and she was really nervous, but I know that feeling. I was calm at Maryland, but this time I was nervous. I was worried about the hills, and if Maryland was just a fluke . . . What if I can’t do it again? That plagued my thoughts. So we got to our respective condos, settled in, and then got some light training in before the big day. Kelly had us meet her and ride up Duplessis. It was challenging but doable, but that’s after a two mile warm up. It would be entirely a different beast at mile 50 and 100. Then we piled into Kelly’s van, and drove the rest of the course. The car got really quiet . . . There were a lot more hills, and a lot bigger than I trained on. This was going to be extremely tough . . . Maybe too tough. So we went to the IM village, and Tremblant didn’t fail to impress. The athlete village was in a ski resort area, with gondolas, shops and restaurants everywhere. It is a beautiful area, and Ironman was everywhere. The local residents made you feel welcome, and the scenery was going to make for a picturesque race, if I could finish it. Before we knew it, it was time for the athletes dinner. Mike Reilly, the voice of Ironman, was there, and if we finished we would get to hear him say those beautiful words “You are an Ironman” to you personally. I could not wait to hear those words. I had to hear that, I just had to finish and hear him call my name. At the dinner, Mike got the crowd excited, working them up and getting the adrenaline going. Afterward, they had a fireworks show for us! The next day we checked in bikes and bags, and went to see the “We are Triathletes” movie that was there for a special showing. More adrenaline rushes, and I would recommend that movie. Some people don’t realize the dedication it takes for one race, and any little thing could throw it off. Then it was time to call it a night and get ready: race day was almost upon us. Fog. We woke up to fog. We got to Kelly’s condo and then down to transition at 5:00am. We prepped our bikes, dropped off special needs bags, and then headed down to Loc Tremblant for the swim. It was wetsuit legal, and we prepped and stopped for photos before heading to the beach to line up. It was a self-seeded by swim time start, so we lined up where we thought we’d finish. But the fog delayed the start for an hour. We were getting cold, even in the wetsuits, and were hugging one another in an attempt to stay warm. Kelly reminded me of our agreement: we run our own race, no matter what happens to the other. We agreed again and finally, the fog lifted enough to allow the race to start. And then we were off! Ironman Mont Tremblant was underway! While the race was underway, the fog had other plans. It resettled on the lake, and it made it difficult to sight the buoys. I counted strokes between buoys 1 & 2, and planned to use that to help know when to sight. With the buoys being on my right, and since I breathe to the right, sighting should be easy, right? But no. I counted the strokes and sighted . . . No buoy. Twenty more strokes, no buoy. Even though I was in a pack of swimmers, I doggie paddled to find the buoy . . . Way over on my left! We swan at an angle. People were swimming everywhere, and there was no way to avoid them. You just had to manage. I finally made it to the first turn, and my left calf cramped. I kept swimming and finally it loosened up, but by the second turn my right calf cramped. Getting to a kayak would be a challenge, as you would have to cut through swimmers going every which way to get there. I decided to keep swimming for the finish, cramp or not. It finally gave way and I was able to exit the water in 1:36:56. I actually swam 2.6 miles instead of 2.4 due to the fog. After a short run to transition (gotta love wetsuit strippers) I was changed and getting my bike out of T1. It was time to see if I could do this hilly ride. Steve told me that Kelly was 6 minutes ahead, and I hoped that I would see her on the ride. The start of the ride was great, and beautiful scenery throughout the entire course. But as we hit the turnaround we were faced with the first big challenge: A long steady climb up without the momentum of the downhill for push you up. Before you knew it, you were out of the saddle, pumping away and dropping gears as quickly as you could. Then you would get a break, and then another climb. My quads were burning, and we had not reached Duplessis yet! I wondered how that was going to go, if I was hurting already. I met up with Julie and Steve, and they said Kelly was heading up Duplessis already. I still hadn’t seen her. Tynah had not been seen yet, but she was on the bike. I stopped and used a Hot Shot drink to relieve cramping, and heading up one of the biggest challenges I have ever done: Duplessis. I have never been in first gear, out of the saddle, and cranking so hard so long that much in my life. Midway up, there was a man banging on a road sign with a rock. Bang…bang…bang! It was annoying until I realized that he was banging out the cadence you needed to make it up the hill. This gentleman was there at my mile 50, and 100. Lord only knows how many hours he stood there banging out the cadence. But it helped me get through that section. But then the quads cramped like never before. It was so bad I barely got unclipped. I got to the side of the road and my legs looked like I was posing for a muscle magazine, my muscles were so defined, yet in such pain. Another athlete was sitting in the grass, pounding on his quads with his fists in an effort to loosen them up. I decided to not sit, as I was afraid that I wouldn’t get back up, but used that tenderizing technique on my quads and it helped. I pushed my bike to a flat and started again. As I reached the last short climb before the turnaround, I saw Kelly. She was flying down the hill. I thought “how am I ever going to catch her?”. I made it to the turn and started down. I had decided to coast if I could to give my quads a rest. Coasting was no problem, as I soon reached 41 mph! It was scary and I was white knuckled all the way down. Suddenly I was on my second loop. I struggled back to Duplessis, and started my second and last climb. I saw Julie, and she said I had an hour to make it up and down Duplessis. I told her I didn’t know if I could. What we forgot was that they added time due to the delayed start. I still had not seen Kelly, and assumed she was heading up again. More Hot Shot, and more screaming quads as I struggled up the big hill. I got to the last short climb and who did I see flying down the hill? Kelly was on her way down. At least I hadn’t lost any ground on her. Another fast downhill (this time less scary, and more concerned about making up time), and I was heading to T2. It took 30 mins to climb up, and 10 mins to come back down Duplessis. Some riding, some walking, but I made it. Or did I? So as I ran to T2, I saw Steve, who gave me an update. Kelly was off on the run, and Tynah was fine and on the bike. So I grabbed my run bag, changed and headed out for my marathon. The run was pretty, and at about mile 5 or 6, I knew who was just in front of me. I ran close and said “I’d know that tattoo anywhere” referring to her beautiful watercolor shoulder tattoo. Kelly smiled and said she wondered when I would catch her. We chatted for a bit and found out that both of us were hurting: Kelly’s back and my quads. We decided that we had plenty of time to make it, and to run/walk together to help each other along. So we ran along until we crossed a timing pad and heard the beep. It sends info to people tracking on their phones or computers and lets them know where you are at. I said “now everyone knows we are together.” Kelly looked puzzled and asked if that was a problem. I said no, but lets have some fun. So as we heard the next timing pad, I sprinted ahead and crossed it and then stopped and waited. Kelly crossed and asked what I was doing. I told her “now everyone thinks I left you.” We laughed and then at the next one Kelly ran over it first. Then finally we crossed the last one together. We were giggling, thinking about what everyone was thinking, with this great running battle going on between us. We saw Tynah as we came out of the long straightaway. She had been throwing up and was walking a lot. We told her she had to cross the timing mat about 10k away in a certain time or they would pull her. We hugged and then made her run off. Kelly and I worried the remainder of our run if she was going to make it. Twenty seconds later, Kelly Hill became an Ironman for the sixth time! We collected our finishers hat, shirt, and medal and headed for the food tent. We grabbed some water and chocolate milk, then off to Kelly’s condo to shower, change, and watch Tynah come in. We got back and met up with Steve who had bad news: according to the tracker, Tynah was going to be 2 minutes too late. Steve, Julie, Kelly’s sister and her girls all went off to find Tynah and push her in to the finish. But they left Kelly and I with no phone, and no way to know what was happening except for watching the clock tower, and listening to Mike Reilly call in the final runners. Mike said on the PA “there’s four more coming”. First were two were men running together, then a woman, but on Tynah. There is a tradition that people dressed as angels run in with the final runner, and here they come . . . But not with Tynah. Kelly and I were on the verge of tears. Tynah had tried so hard, and it was so close, this can’t be the way it ends. After a brief stop in the medical tent, I presented Tynah with her finishers hat and shirt. She got her medal before going to the med tent. At one point as she lay on the cot in the med tent, her eyes opened and she looked at me with a huge smile and said “I really did it!” Yes Tynah, you really did! You are an Ironman! We had one more day to relive our race, and enjoy each other’s company before heading our separate ways. I truly hope I can race with them again. Kelly is such an inspiration to me, and Tynah shows that you never give up. Hopefully we can get Julie and Steve involved in the next one and have our own group of 5 at the next one. It was a blast. Next time, I go to Colorado to train on hills before tackling Duplessis again. Thank you Kelly, Tynah, Julie, Steve, Ryleigh, Paige, Megs, and Kenna, and the Hill family for making this a great time. Thanks Jenni for getting me ready for this. I really did it! Ironman #2 is complete! Time to look for number 3. There was a lot of things to be happy about in 2017. A lot of good things happened, and I experienced many wonderful events. So here are just some of the highlights of 2017, and what lies ahead in 2018. Sponsorships – I only look for sponsorships from companies whose products I use and endorse anyway, so I was thrilled to be sponsored for a second year by Honey Stinger gels, chews, and waffles, and by Brooks running shoes and apparel. Most people who run with me always see Brooks Pure Cadence shoes on my feet, and Honey Stinger gels in my pocket. And no doubt you’ve seen #HSHive or #BrooksPro or #Runhappy on my Facebook page. Now I’d like to thank Nuun Hydration for sponsoring me for the first time. All my gym bags have Nuun canisters in them, and it really helps to keep me going during long workouts. So you’ll be seeing #Nuunbassadors or #Nuun on my Facebook posts as well. Coaching – the half marathon groups have been awesome, and I was happy to watch so many of them complete their goal and tell me that they felt great when they finished! That’s always a great thing to hear, that they could have kept running. I had one athlete complete not only a triathlon, but her first full marathon. She looked good at the finish to boot. Another athlete is training for her first full marathon, and now thinking about a sprint triathlon. With. Her determination and dedication, the sky is the limit for her, and it is my honor to be alongside these athletes as they realize their goals. Events – I had a bunch of firsts, a sub 2 hour half marathon among them. But the greatest thing that happened in 2017 was in Maryland when I heard those eleven words “Travis Kneale, from Des Moines Iowa. Travis, you are an Ironman!” It was the hardest day of my life physically, and one of the hardest mentally, but one of the most rewarding that I have ever had. All those hours training, getting up before dawn to swim, running in the dark, long and lonely bike rides of 100+ miles, it all became so worth it to hear those words. When I ran my first half marathon, I said I’d get a tattoo to commemorate the event. I put it off. I said the same thing after my first full marathon, triathlon, and 70.3. Well, now that I completed a 140.6 Ironman, what better time to fulfill that promise? So the training begins again, and hopefully my friends Mel and Karen, who are joining us on our trip to Mont-Tremblant, will translate French for me. August in Canada should be beautiful, and I hope successful. That’s just a few of the highlights of an awesome year. 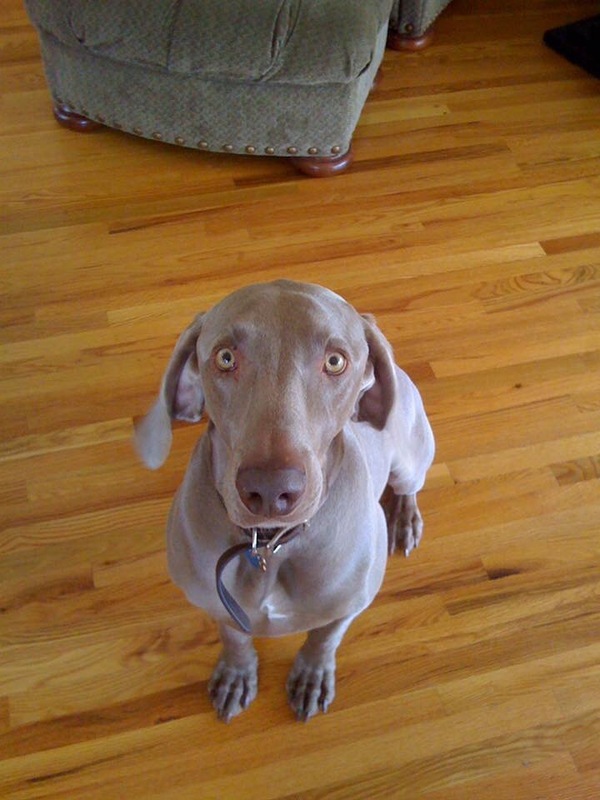 There were some lows (my sweet pup Maverick crossed the Rainbow Bridge), but it really has been an awesome year. A few short years ago, I watched a friend complete an Olympic distance triathlon and thought “I’ll never do that”, but here I am – an Ironman! You just have to believe in yourself, get out of your comfort zone, work hard, and most of all…try! May 2018 be the best year for you, and fill you with happiness and joy! 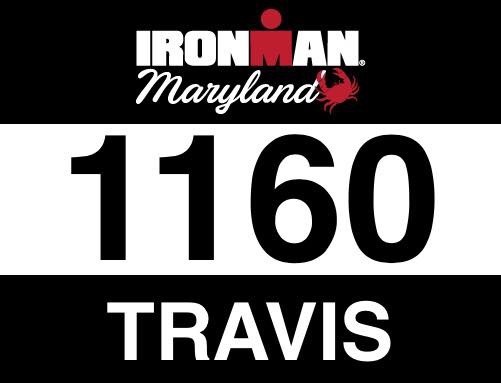 The bags were packed and loaded, the bikes put in the car, all that was left was to start the drive to Cambridge Maryland and to the adventure of a lifetime: Ironman Maryland. It seemed that when I signed up, that October was so far away. Suddenly October was upon us, and it was time to see if all those hours and miles training would hold up. There was that little voice inside questioning whether I could do it, did I train hard enough, but it was time to see. We started the car and off we went! Strangely enough, I was calm on race week, and that never happens. Two weeks prior, I was a nervous wreck, and now I was as calm as could be. It didn’t make a lot of sense to me, and I wondered why I was acting like this was just an out of town training day, and not what it actually was, and what it’s called: “The Hardest Day in Sport”. We stopped in South Bend Indiana for the night and stayed right by Notre Dame University. We decided to take advantage of it and did an early run through the campus. It was beautiful! We made it to Cambridge last Tuesday night and met our hosts. They were a wonderful couple, and seemed excited that I was racing. We had access to their pool, canoes, pretty much everything. We really got lucky finding this place. The next morning we made our way to the Ironman village to check in. It was really happening! We then had breakfast and then went for a quick swim. There were sea nettles (jellyfish) everywhere, and a fellow athlete told me to coat all exposed areas with Vaseline, so the sea nettles wouldn’t stick to you and sting you. I took the advice and didn’t get stung during the race, but got stung a few times in practice. Wherever you went in the town, people let you know they were happy you were there. Stores and streets were decorated, and you could tell the residents were as excited as we were. A lot of locals volunteer at the race, and have for years! It is a really amazing community. On Friday, we drove to Baltimore to meet my coaches, Jenni and Jeff Keil, and to bring Jeff to the race with us. Jenni unfortunately could not stay, but we had a great pep talk before we headed back. I was still calm and the race was less than a day away! Before I knew it, it was race day! I got ready, and just like that I was in transition setting up my bike and filling my hydration system. I put on my wetsuit and even laid down for a bit before it was time to line up for the swim start. We self-seeded by expected finish time, so I got in the 1:30-1:40 group. Suddenly I was walking into the water and on the adventure of a lifetime! 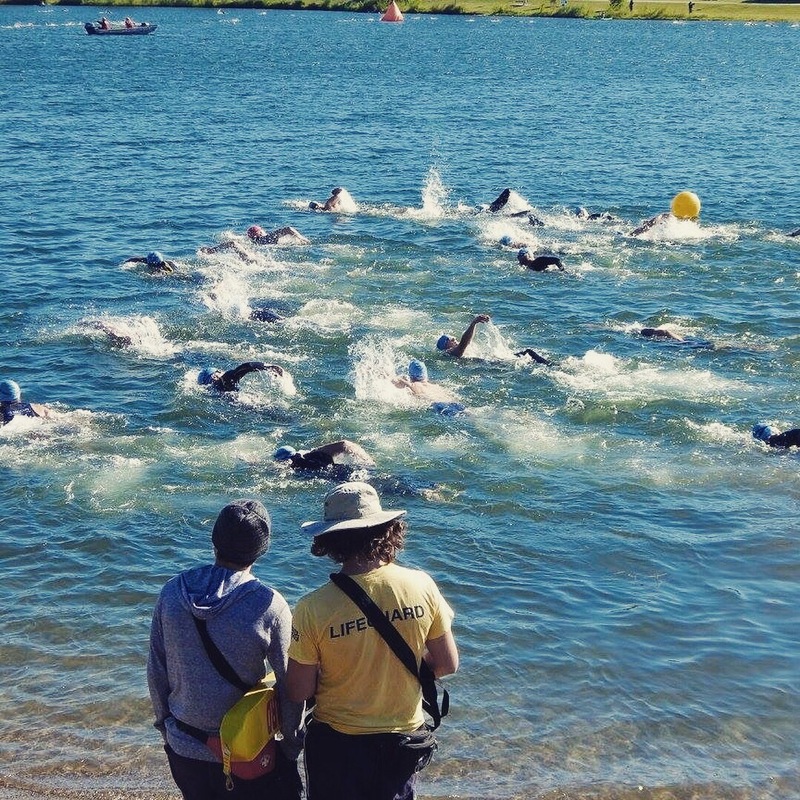 The swim was largely uneventful, especially with over 1300 swimmers in the water. I fought the current more than the other swimmers, and then I was out of the water and onto transition. The wetsuit strippers got you out of your wetsuit in less than a minute, and then someone handed you your bike bag. Then it’s off to the changing tent to prep for the ride. The bike was extremely flat and very windy, with head/cross winds of 30-40 mph. It was tough, with little breaks from the wind. Around mile 80 I started feeling nauseous. I think I have too much protein in my drink, but it was too late to fix that now. It affected me throughout the remainder of the ride and the entire run. 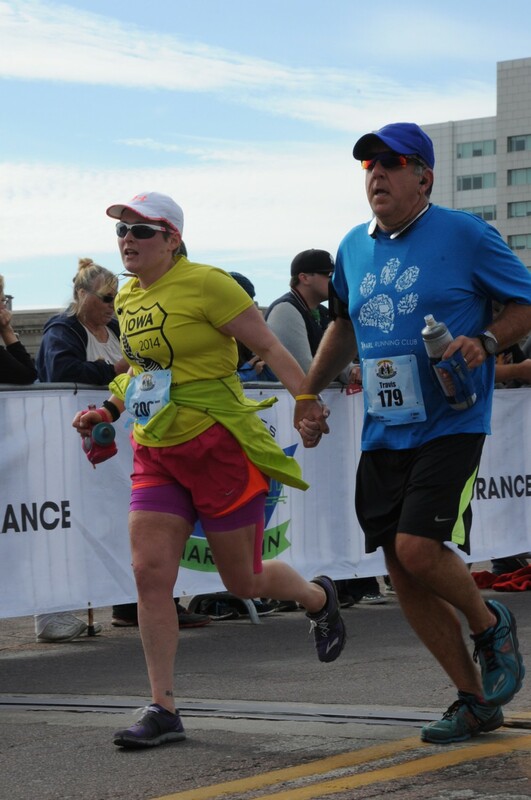 When I got back to transition, I saw Jeff and told him I was feeling sick to my stomach, and that I didn’t know if I could run hard or for how long. Jeff said to run when you can, walk when you have to, but that I could do it. I had to decide whether to throw up and get it over with, but risk dehydration and possibly being too ill to continue, or to deal with it and keep moving forward. I opted for moving forward. The run was long, especially feeling like you are going to get sick at any moment. I went into my special needs bag, hoping I put something in there for an upset stomach. I didn’t. So, I grabbed my Advil, band-aids, and my Dr. Pepper (my treat), and took off. I forgot my headlamp, and once you are in your bag, it gets tossed. So when it started to get dark, I realized my mistake. I was so upset about that, but lesson learned. I never figured how to see what time it is on my watch when you are recording a workout, so I lost track of time. Some areas get really dark, and I tried using the stars to tell what the time was. Man, there were a lot of stars! It had to be about 10:30-11:00pm. 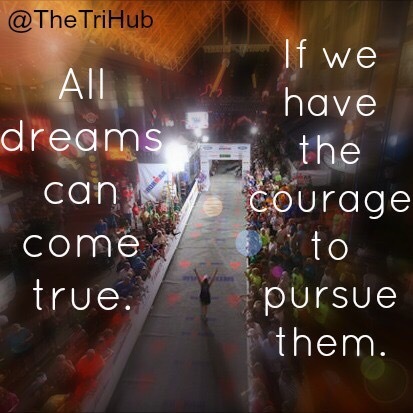 I remember my dear friend Kelly Hill, who has completed 5 Ironman events, telling me that your mind will go to some dark places, and whether you cross the finish line or not depends on getting out of those dark places. I was about to enter mine, as I realized that if it was 11, I was not going to make it! I figured that if it was 11pm, and I had 8 miles to go, that I was going to be 4 miles short if I continued on this pace. But I couldn’t go any faster, and I was trying. I got depressed and wanted to sit down and quit. Since the run was a 2.5 loop out and back, I saw people heading in the direction I was coming from. I asked what lap some were on, and they said they were starting their second lap. I was finishing my second. I wished them luck, but in my mind I knew that the wagon would be coming to pull them from the race . . . and soon they would be pulling me too. I turned the corner and saw Julie and Jeff. My wife ran up to me and said she was proud of me. I almost cried. Here I was failing, and she was proud of me. I finally got up the courage to ask her what time it was, and was shocked when she said 7:47. My dark place was melting away. I asked her two more times, and she finally said “like the plane”. I was elated, as I had only 6 miles left and plenty of time. I started to really enjoy the run then. Crossing the line was a blur. I thought I would lose it, but I didn’t. I crossed, got my photo, my medal and hat and finishers shirt, more photos, and then I talked to Julie and Jeff and we bought some things in the Ironman village. It really hadn’t hit me yet. Maybe I was tired, or preoccupied, or who knows what, but I was thinking that I would be more emotional. When we got home, our hosts left a bottle of champagne and a poster board with congratulations written on it! They even were out on the course cheering me on! They were incredible, and even with an upset stomach, the champagne tasted delicious. The next day, my wife forwarded me the video she took as I crossed the line. 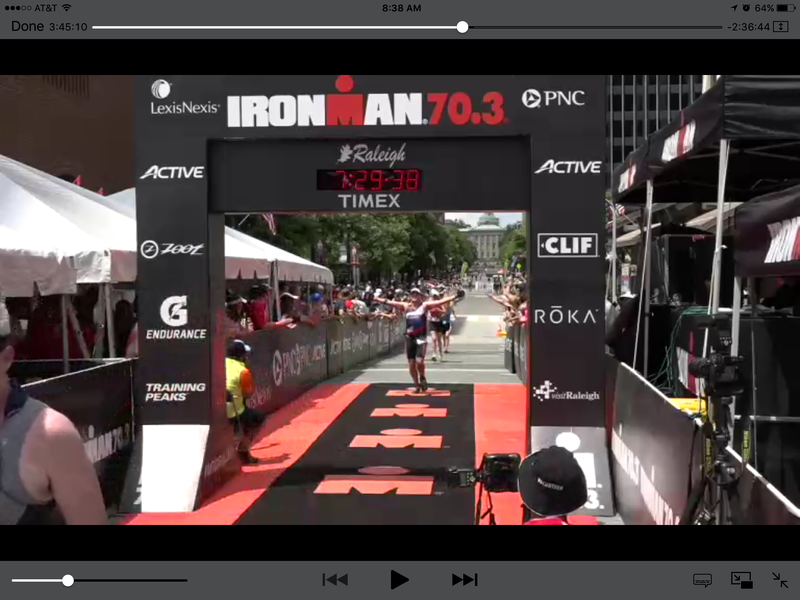 I got to really hear them call my name, hear that I was indeed an Ironman, and the tears started flowing. I still tear up talking about it now. I went from a 3 pack a day smoker, to 40 lbs overweight, to an Ironman! It’s almost surreal, and I cannot wait to start training for the next one. I tried to thank everyone personally for their help in getting me across the finish line, but I want to mention a few here that really helped in more ways than they know. To my wife Julie, for loving, supporting me, and even joining in on this crazy way of life. To my coaches Jenni and Jeff Keil, for training me, helping and encouraging me, and being such an amazing part of making me who I am today. To Connie and Eric McGarrah, who always supported and encouraged me, and always made me believe in myself. To Chris Matthews and Tiina Erb, who text with me daily and offer advice, encouragement, or just let me vent and they listen. You are awesome. To Kara Palczewski, my running wife, for training with me, photographing me, making my awesome video, and for being one of the most amazing friends I have ever had. Love you to the moon and back! To Jodie Dunker, who is my biggest fan, official race photographer, charm maker, and a better friend than I deserve. Love you! To Kelly Hill, from making videos early on showing me the medals I’d soon have, to offering unending support, encouragement, advice, tips, and even texting me to help me pack my special needs bags and my bike and run bags as well. You have been so big a part of this, that I felt you crossing with me at the finish line. The love and admiration that I have for you cannot be described. I cannot wait until we can do one together. I know I’ve missed a few people, and know that I love you all dearly. Now we start training for Ironman #2. If I have my choice and can afford it, we will be heading to the Great White North for the next one. We will know more by the end of the year, but I think Mont Tremblant is calling. I can’t believe it’s been so long since I’ve sat down to write a blog post. There has been so much going on, and I guess time slipped away from me. Maybe I need to put a time on the calendar to write each week. So let’s just get started with a quick recap of events, and then onto newer things. So here we go….. Since I last wrote, I have run in a couple half marathons; The Drake Road Races half and the Dam to Dam. My running wife Kara was surprised at the finish line of the Drake half by her boyfriend, who proposed to her at the finish! It was awesome to witness, and I am so happy for them both. They are wonderful people, and I wish them a lifetime of love and happiness! The Dam to Dam was brutally humid; to the point were I got nauseous for a bit on the run. It was a hard race, and there were a lot of people having heat related issues. So the elusive sub 2 hour half still eludes me, and stands at 2:02:37. One day, I’ll break that time…. We also did the Copper Creek Sprint Triathlon this past Sunday. My coach decided that we were going to use it as a workout and train right through it with no rest days, so we did. On Saturday before the event, I rode 66 miles in 3:47:33, then ran for 20 minutes off the bike (about 2+ miles). So when the triathlon rolled around the next day, I decided that I shouldn’t expect much as far as timing goes. Boy, was I wrong! I PR’d the race from my previous time by 9 minutes! Other than horrible wind on the bike, it was a great time. I was the calmest in the water than I have ever been at a race, and ran sub 9 miles for the 5k. It was a great day! These are the changes I’m seeing. There is a confidence growing in my abilities, and it’s coming from within. Instead of wondering if I can get it done, I’m wondering if I can make it harder. Instead of doubting myself, now I tell myself that I need to “finish this off and you’ll have the rest of the day to yourself.” But then, after a bit, I wonder why I can’t throw in another workout because I have some free time. It’s this positive mental state that makes these workouts seem a lot easier than they truly are. Because believe me they are hard! That 66 mile ride? First 33 miles were headwind. My legs were screaming until I got to the turn-around point. Then, with a tailwind, my legs wanted to push faster and enjoy the speed. I hope that confidence continues, as it is an awesome feeling. Yesterday I went to the lake to swim. It was extremely choppy, with whitecaps all over. I watched two swimmers as they swam a short distance and quit. As I geared up, I thought “What if Maryland is like this? This will be good practice!” So into the water I went, getting pushed around by waves, some of them slapping over my head like some kind of sandlot bully. But I wasn’t about to be bullied out of the water, not until I finished my workout. I pushed on, swallowed a little water, had to stop and sight more than once, yet it was the calmest in the water I have ever felt. It was amazing! Now before, I would have said ‘no way” and went to a pool. Now I was happy for the challenge. So before I end this, I want to thank Kara Palczewski for the bike pictures above and the swim pictures below. 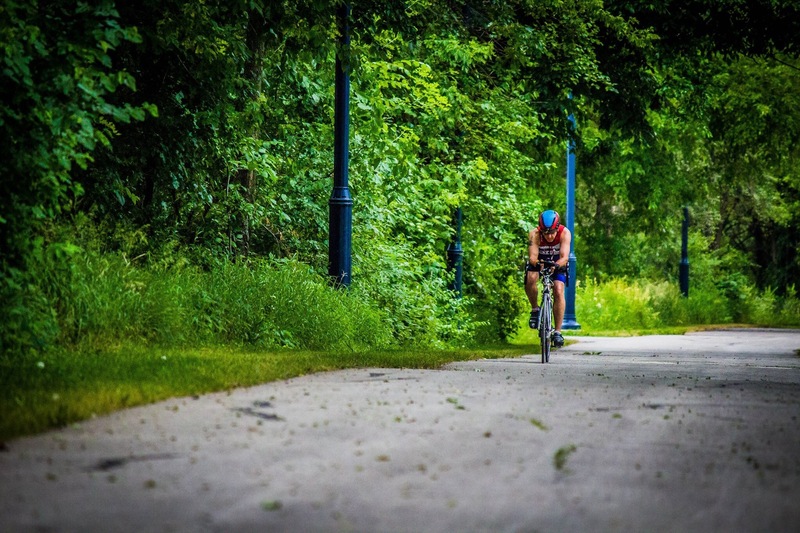 We are working on a photo journal of my training leading up to IM Maryland, and she is just amazing with the camera. We still have run photos to do, so I’ll have more to post. But if you are in need of a photographer, give Kara a call. You will be extremely happy with the results! I guess I should start this post with the sad news first. 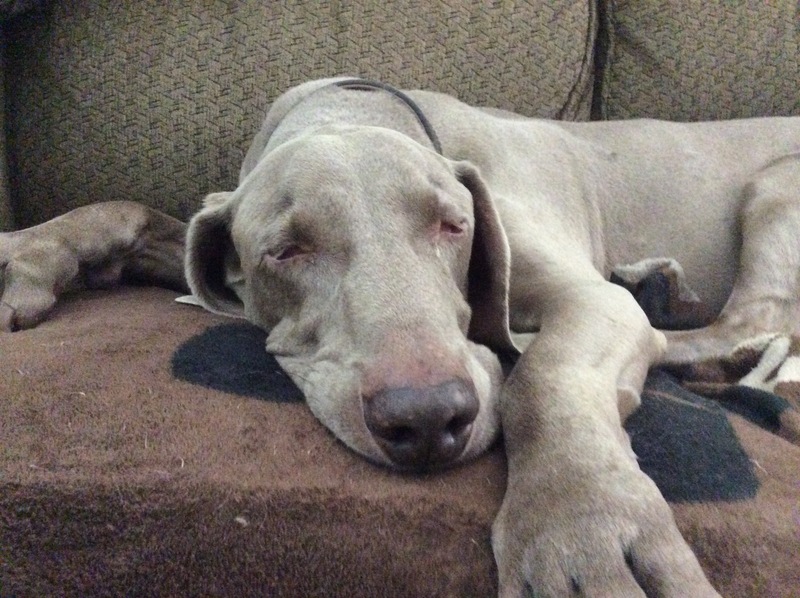 I had to say goodbye to one of the most loyal friends I’ve ever had. 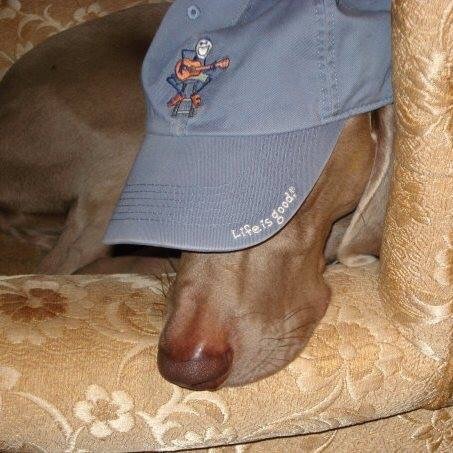 Maverick, my Weimaraner, crossed the Rainbow Bridge on January 29, 2017. The poor guy had congestive heart failure, valve disease, and arthritis, and still wagging his stubby little tail at me. Try as we did, the medications and treatments were not helping. One of the hardest things you have to do as a pet owner is to forgo your selfishness to hang on and let them go and be pain free. Maverick my friend, one day we will be together again. Please don’t forget me, as I will never forget you. R.I.P. Buddy. My department at work moved locations, and it could have thrown my training into disarray. See, I was right across the street from the YMCA, and could get a lunch workout in, and then only have one evening workout left. It was a great arrangement. But moving to the new location, with the work gym less than satisfactory for what I needed, a change was in order. So now I’ve become a member of the EMC (Early Morning Crew). I get up at 4am to get to the gym (which is a few miles away from my office, and a YMCA) which opens at 5am. I am now one of the people I used to laugh at…standing at the door, waiting for them to unlock it and let me in. But I can get a good workout in and still be at work well before 7am. Then all that’s left is an evening workout if I have two scheduled. If there’s a will, there is a way! I mentioned last Saturday, and the swim/bike brick that I did. While my coaches, Jennifer and Jeff Keil (seriously, go to elevenathletics.com and look them up…amazing people and awesome coaches) had a structured bike workout, the only thing in the swim was a ?. I took it to mean maybe swim if I felt like it, but what to do? So I got to the pool and did this.. So, until next time, remember to believe in yourself, dream big, and have the courage to step out of your comfort zone and give it a try. You’ll never know how amazing you can be if you don’t try. I passed! It was one of the tougher tests I have ever taken, but I completed the two exams and I am now a certified triathlon coach. The first exam was a multiple choice test, and although challenging, it went really fast. I think that a couple of questions were arguable due to personal coaching philosophy, but that’s ok. The main thing was I passed, and received my email on how to proceed to part two. This is where the “fun” started. It’s called a ‘short answer’ test, but the truth is, its nothing of the sort. You begin by downloading all the necessary content: athletes bio, health assessment, assessments for their run, bike, and swim, base training schedule, the athletes availability schedule, list of goal races and their information, and the test. Now you start and you use every sheet of paper you downloaded. For example, I was supposed to come up with a three-week general prep schedule for my athlete, taking into account the athletes availability, particular weaknesses in each discipline and how to correct them, getting at least one intensity and one endurance workout per discipline per week, along with core/strength training. That’s part ‘A’ of question 1. Some questions went to part ‘F’, so you know that it’ll be a long test. The good thing is that it wasn’t a timed test, so you could stop, get a cup of coffee, review notes, bang your head into a wall, and return. I decided to write everything out, and then when I was content with my answers, transfer it to the online format and send it in. So I took my time, went over it again and again. Changed and corrected mistakes, and the spot on the wall where I banged my head grew larger. Finally, after almost a week, I just wanted it to be done. I knew that if I did not pass, that they would suggest areas to review to improve your score one time, so I decided that I would send it in, find out where I messed up, and focus on those areas. So I nervously hit the ‘send’ button. I breathed a sigh of relief; it was off. I looked down and started gathering my papers when I noticed something….a mistake! How did I miss that?!? I could hear the laughter all the way from Kona. Now I dreaded getting a response, because I was certain that I would be doing the entire test again. Within the hour, I received an email stating that they received my test, and that it can take up to 14 days to grade and return it. So, now all I could do is wait, and go over my notes to prep myself for the retake. The next day, I received an email from Ironman University. I was scared to open it, knowing I’d be knee deep in schedules and stretches, zones and threshold levels. Finally, I opened the mail….. I almost cried. I was so worried, and yet I did really well. I read that email over and over, making sure they sent it to the right person. 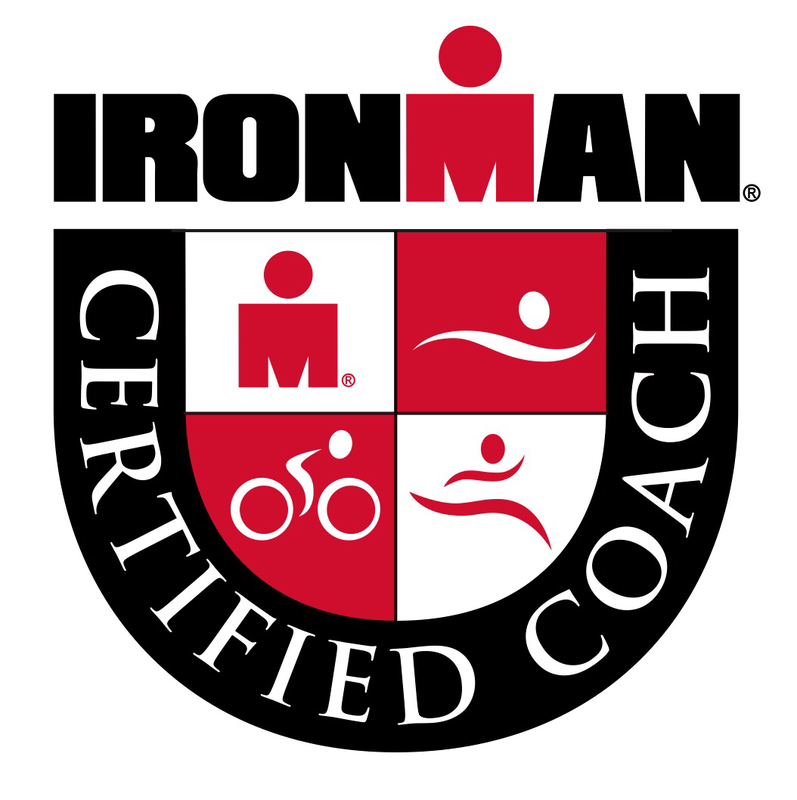 I was now a certified triathlon coach through Ironman University. I have already started putting the knowledge learned into action, as I have two athletes that are beginning their triathlon journey that I am coaching. While my primary focus is on the beginner triathlete, I hope to follow them as they grow and see how far they go in the sport. I enjoy writing the schedules, planning the workouts, hearing “Are you trying to kill me?! ?” After they see the schedule, answering questions, etc. But the thing I love the most is encouraging them. Letting them know that they can do this, that they are amazing, and even though the workouts get harder, they in turn get better. It’s fun to see them grow, not only in ability, but in self confidence. So now I have coaching triathletes going on, and my coaching half marathoners is about to start up again. Then you have to remember that I have my workouts to do to prepare for my first Ironman (Maryland, October 7, 2017). The plate is filling up, and I’m enjoying every minute of it. When I chat with people about working out and hear them say “I can’t”, I just smile because I know they can, and I tell them why. I did . . . and so can you! It’s time for a long overdue update. 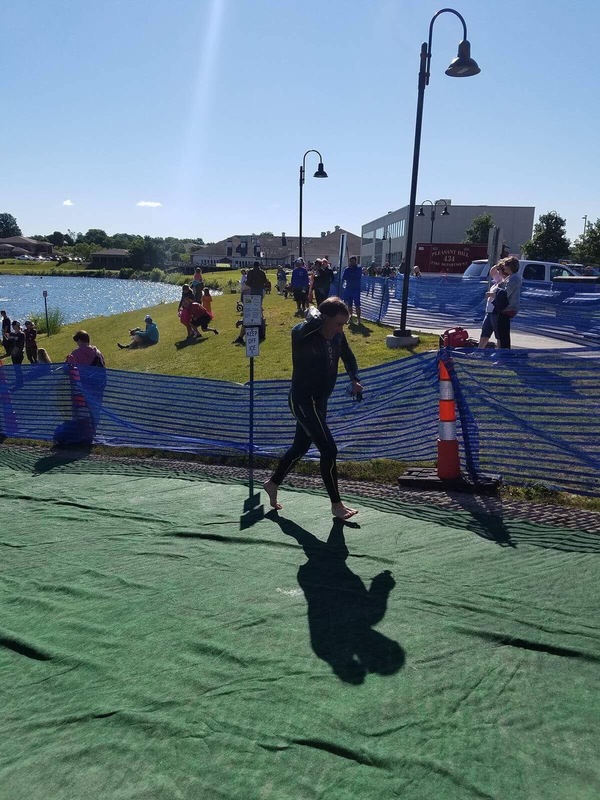 I finished my second Des Moines Olympic distance Triathlon recently, and set a PR (personal record) by cutting 37 minutes off last years time! That’s huge for me! Granted, it was a bit cooler than last years event, but I really give credit to my coach Jennifer (Jenni) Keil and the E11even Athletics team. Jenni trained me for my Ironman 70.3 in June, and during that training I saw what I needed to change to be successful in the Olympic distance. 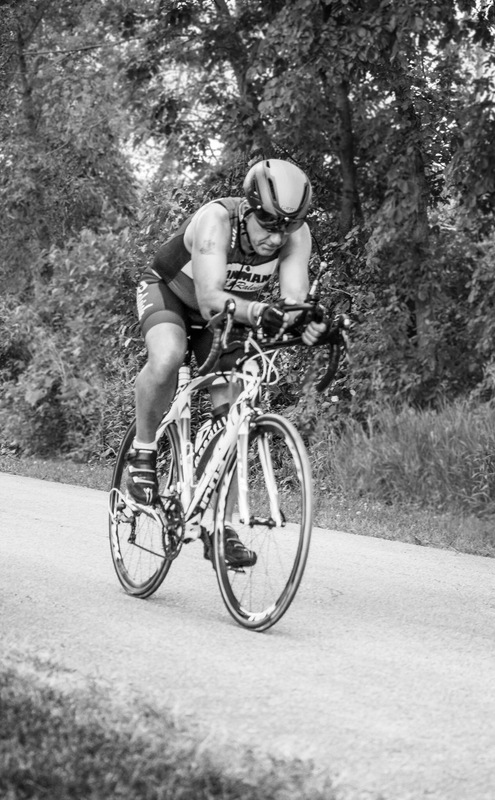 I learned to hydrate and refuel, even if I didn’t feel like it, and it paid off big at the Des Moines Tri. No sick, weak feeling, no hitting the wall, just a strong swim, bike and run! It was awesome! So, now for the news! 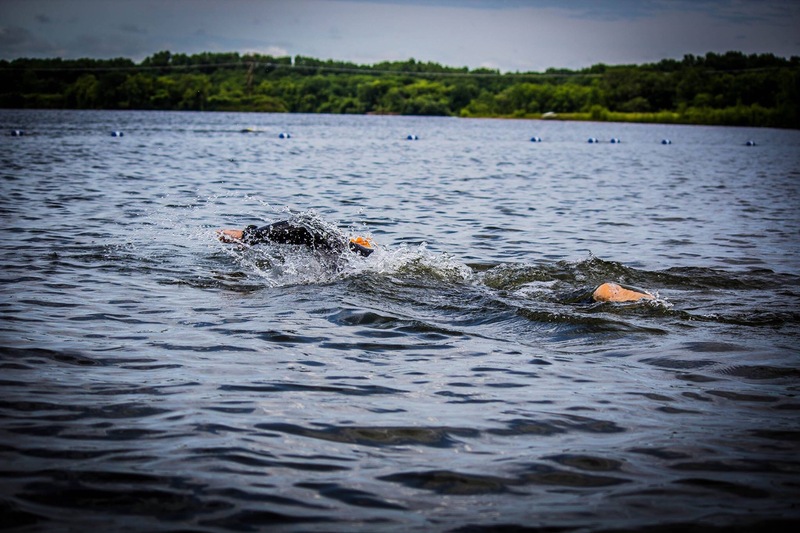 My coach and I had been discussing starting a group to train beginner triathletes in the sport, and to help them prepare for the sprint or Olympic distance triathlons. Jenni was also talking to my friend and fellow teammate Chris Matthews about this, and Chris and I were both excited to discuss it and wanted to be a part of it. Well, that time is now! E11even Athletics has started a beginner triathlete program called “Earn Your Stripes” (see image above), and it will take beginner athletes and guide them through the three disciplines as well as core/strength training to prepare them for their first triathlon. Coach Jenni has asked Chris and I to head up the program as the coaches! This is quite an honor, and I am happy and excited to assist taking E11even Athletics to the next level, and to help beginners find the same love for the sport of triathlon as I have! 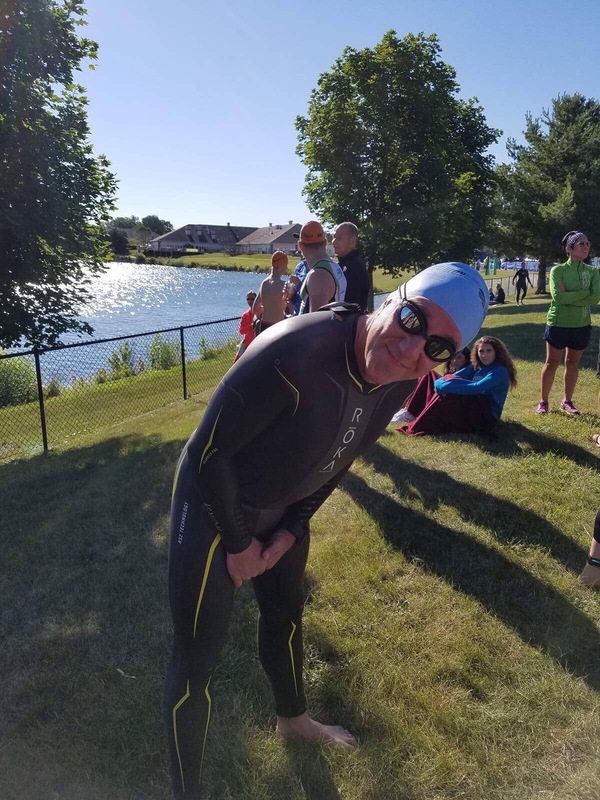 Many of you know that I currently coach runners training for their first half marathon, so to move up to training others for the swim and bike portions, as well as the run portion of a triathlon is exciting, and of course it makes me a little nervous. I want to do the best for the people who put their trust in me, and I want to be sure that, while triathlon training is tough and at times demanding, the athletes also have fun. You have to enjoy what you’re doing, or you won’t do it, simple as that. My fitness journey has been an amazing adventure. 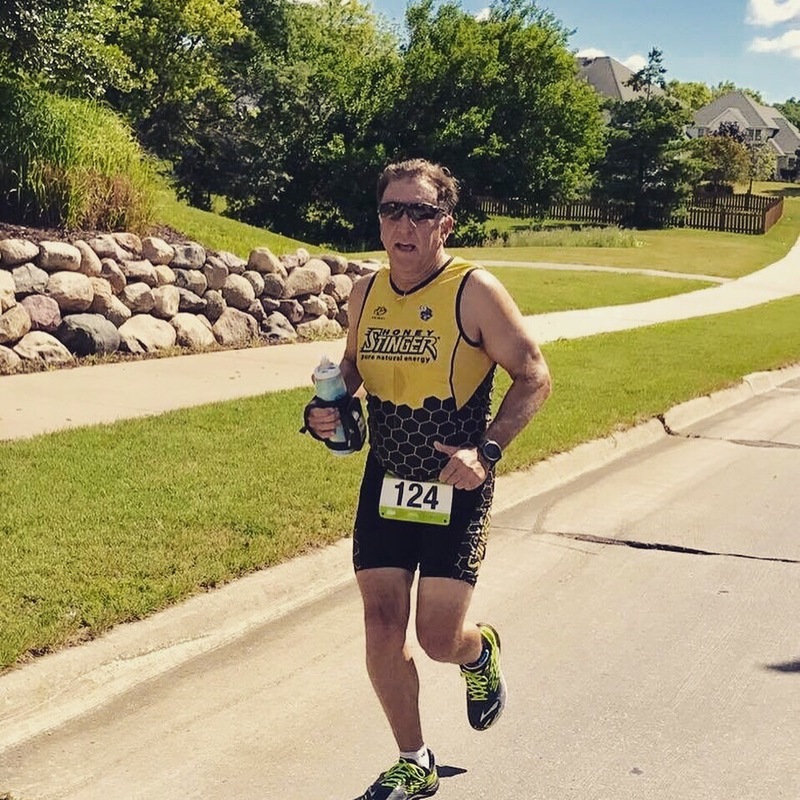 From barely running a quarter mile on the treadmill to completing a Ironman70.3; from not knowing anything about the sport to helping others navigate their way through it. To make the news even better, I am currently studying to become a certified triathlon coach through Ironman University. I hope to complete this training soon, and put the knowledge I learned to work helping others. 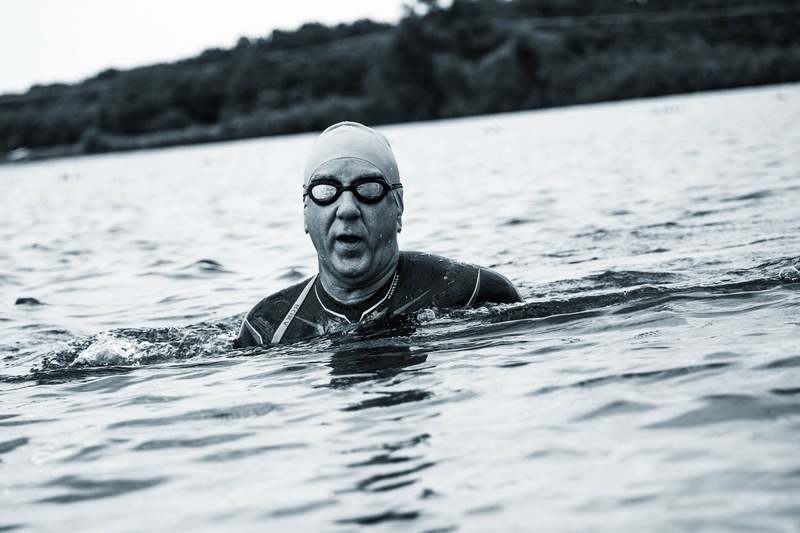 So, if you are thinking “I’d like to do a triathlon”, look no further. Go to http://www.elevenathletics.com. Ask questions, sign up, and join us. You’ll be off to your own amazing adventure too! You will love the team at E11even Athletics, and you’ll be amazed at what your body can do!